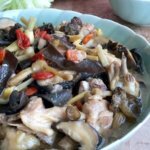 In my earlier posts about Thai food recipes, I mentioned that my husband worked in Thailand for 8 years. During that time, one of our favourite things to do during the weekends and evenings was to explore the local eateries patronised by native Thais. 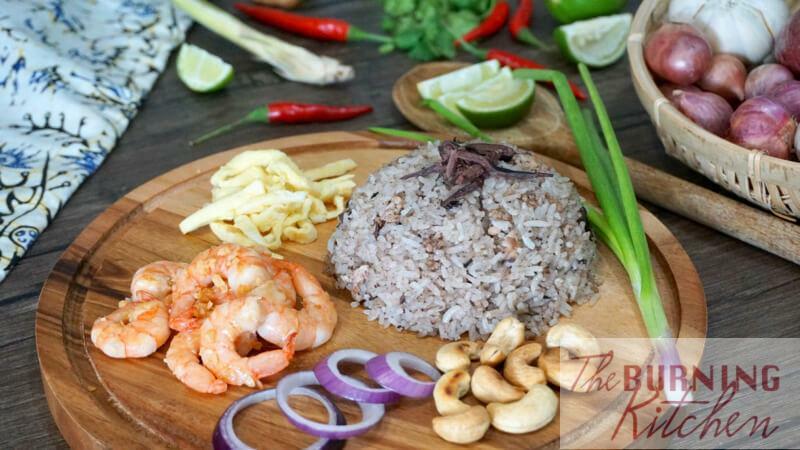 My favourite dishes include the many varieties of Thai-fried rice, from the ever-popular Pineapple Fried Rice (Khao Phad Saparod) to the more unusual ones like Chicken Fried Rice with Lychees and Longan (Khao Phad Gai). 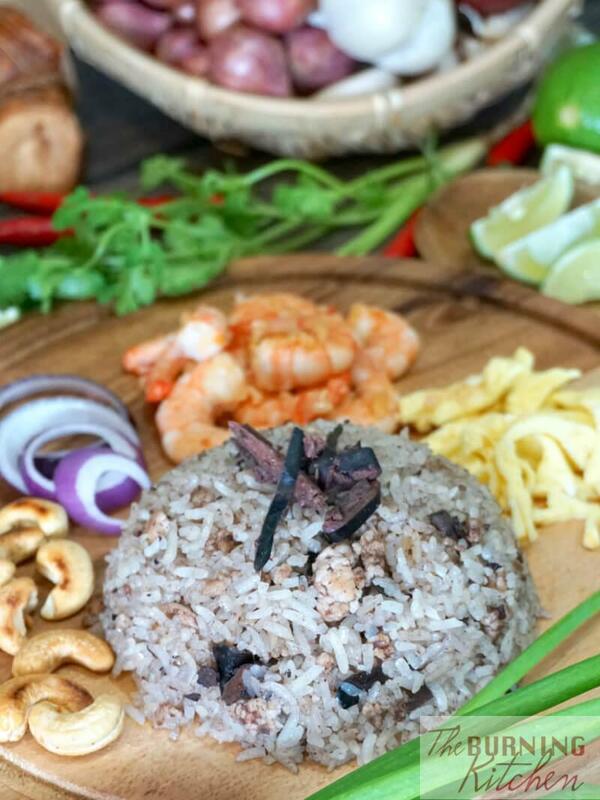 So for today, I am going to share with you the Thai Black Olive Fried Rice recipe, also known as Khao Phad Nahm Liap Dum. 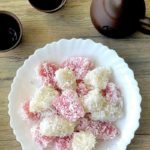 I learnt this recipe by observing how the local stall owners prepared the dish, and then experimenting in my home kitchen until I could replicate a taste of what I had. 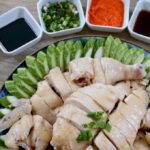 In Singapore, it is not easy to replicate the authentic taste of Thai food, as many of the Thai sauces and seasonings are not widely available in Singapore. So although I’ve been wanting to share this recipe for quite a while, I couldn’t find the brand of Salted Olives which I used in my cooking. 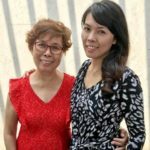 It so happened that a Thai friend of ours was heading down to Singapore. So I quickly messaged her and asked if she would bring me a can of salted olives. 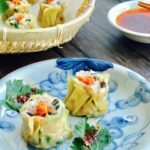 That’s how I was finally able to cook this dish and share this recipe with you. Here’s what the can looks like below; at the back it says ‘Golden Horse Brand 金马牌‘. Perhaps you might find it in Golden Mile, though I have not checked. 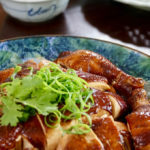 If you can’t get hold of the Golden Horse Brand, and you are not too particular, you can try this other brand instead which I saw online on Foodxervices website. I have personally not tried this brand, so I can’t say much. But if you do manage to try it, do let me know in the comments how it tastes. 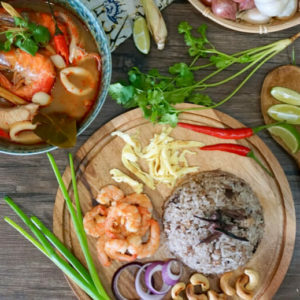 By the way, Thai Olive Fried Rice goes very nicely with Seafood Tom Yum Soup (Tom Yum Talay) an authentic dish which I learnt from my friend’s mother who lives in Chanthaburi province which is famed for its seafood and good food. 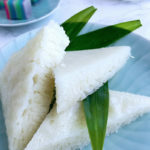 I will write more about my trip there in my next post about Thai food! 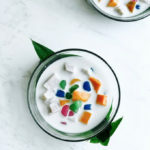 Last but not least, you wouldn’t want to miss out on classic Thai desserts like Thai Mango Sticky Rice (Khao Neow Ma Muang) and Thai Red Ruby in Fresh Coconut Milk (Tub Tim Grob) to end off your Thai themed meal with a bang! 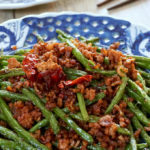 HOW TO MAKE OLIVE FRIED RICE? Cook the rice the day before. Once cool, store it in the refrigerator. Wash the pork and mince it. 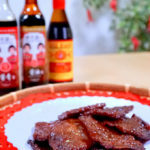 Marinate the pork with 1 tsp fish sauce and 2 tsp oil for 15 mins. Set aside for later use. Shell and devein the prawns. Wash and pat dry. 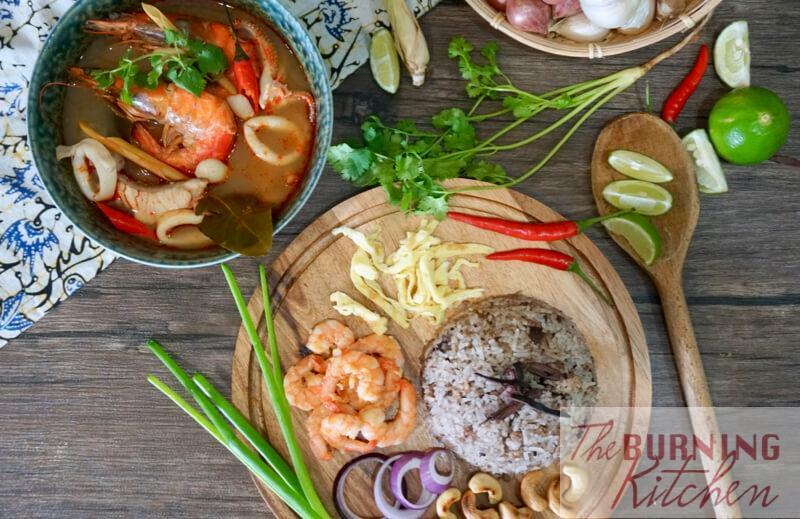 Marinate the prawn with 1 tsp of sugar and 1/4 tsp of salt. Remove the skin from the garlic and chop finely. Remove the seeds from the black olives. Place them in a bowl and use the back of a spoon to smash it finely. Beat the eggs and add 1/4 tsp of salt to it and mix well. Set aside for later use. Wash the parsley and cut into 3 cm lengthwise. Next, wash the spring onion and set aside for garnishing. Wash the chilli and cut into small pieces removing some of the seeds. Discard the seeds. Heat 1 tbsp of oil in the wok over medium high heat. When heated, pour in the beaten egg and swirl around the wok to form an omelette. Once cooked, remove the omelette and set aside. In the same wok, add 1 tbsp of oil over medium high heat, then add in the garlic and fry until aromatic. Next add in the prawns and fry until just cooked, then remove and set aside. In the same wok, add 2 tbsp of oil over medium high heat. Then add in the black olives and minced pork and fry until the meat is cooked. Wet your hand and use it to loosen the rice. Then stir in the rice to the meat and olive mixture. If need be, add a little water to the rice to loosen it further. Continue to fry the rice until it is well mixed. Add the fish sauce to the rice and mix well. You can also add a dash of pepper (optional) and chopped chilli padi (optional) if you like. Slice the omelette into thin strips. Scoop the Thai Olive rice into individual serving plates. Then add the side dishes of prawns, sliced omelette, sliced onion, roasted cashew nuts and a spring of spring onion. Garnish the black olive rice with Thai lime wedges and a sprig of spring onion. Best served hot. Squeeze a little lime juice into the rice and eat it with the spring onion. Do not add salt when using Thai olive to fry the rice. 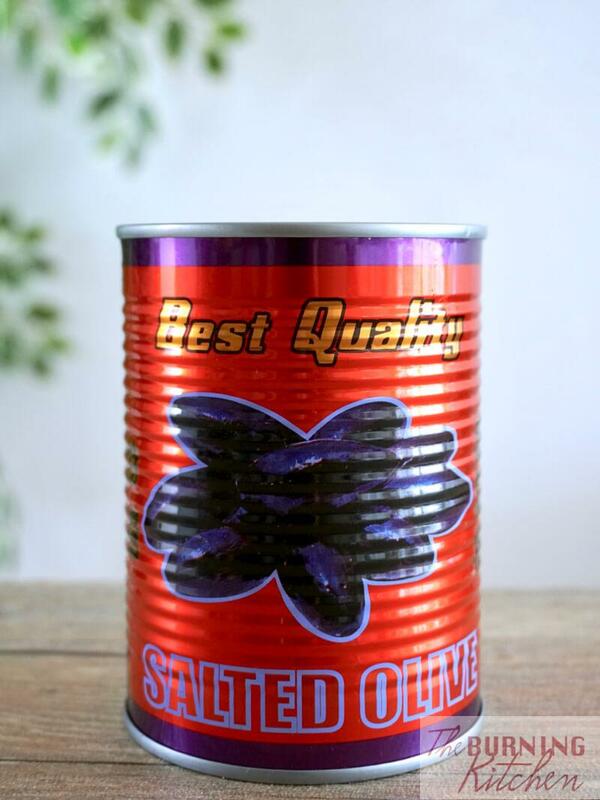 Thai Black Olive is very salty if eaten on its own. You can buy the Thai Black Olives from Golden Miles Shopping Centre. They come in a bottle or can form. You can also buy raw Cashew Nut to toast by yourself. You can toast it in the oven, small toaster oven or a turbo broiler. Please make sure you watch closely without having them burnt till black color. Thai lime is a better choice for they are more tangy and flavourful comparing to Vietnamese or Malaysian ones. For any kind of fried rice, cook the rice a day before. Freshly cooked rice will tend to break up easily and become lumpy during the frying process because it is still moist and soft. Be mindful that some fish sauce are very salty. Taste before adding more to the rice. Add spring onion to fried rice for more bite. For every kind of fried rice served in Thailand, it often come with a sprig or 2 spring onion. With every mouthful of fried rice, the Thai will bite the spring onion directly from the sprig. That is how they eat fried rice with spring onion. Egg-Free: You can skip the egg. Nut-Free: You can skip the cashew nuts. 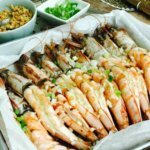 Shellfish-Free: You can skip the prawns. Thai Black Olive Fried Rice (Khao Phad Nahm Liap Dum) is a savoury Thai fried rice dish that gets its rich umami flavour from Chinese (Teochew) Salted Black Olives, making it an irresistible treat for the tastebuds!